Inner Chingona: Thanks for 2013! 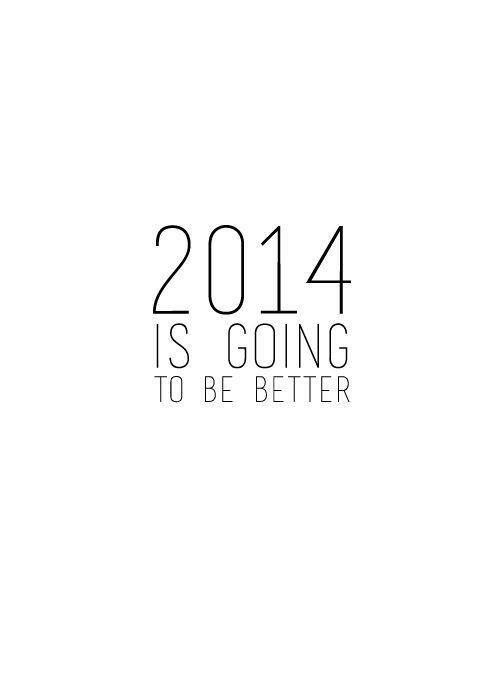 On to 2014! While the first half of 2013 had me going thru the fire daily getting my personal and legal issues resolved. The second half of the year, thankfully, was much more stable and peaceful. For the first time in many years, I have had to embrace major change, a fuerzas, in all areas of my life. I feel like I live my life on a schedule for everything these days LOL, with things mapped out for the first time in a long time. I completely depended upon schedules to keep me on track emotionally especially so that I could get thru some very dark days. Living on a schedule has really helped me to be able to take care of the things that I need to like my job, my finances, and taking care of my folks, while at the same time, think about how I want to start over and live my life again. After so many months of insomnia, stress, and drama; I am so grateful for the very simple things in life: getting a good night’s sleep, waking up knowing that I’m ok and that my loved ones are safe, grateful for my job where I’m learning and growing professionally every day. While I can never forget, I remain convinced that the only way that I will move forward is to practice forgiveness and gratitude. It may sound so cliché but when you go thru something traumatic, it is so comforting and energizing to hold on to the very simple and basic things to help you as you recreate your life. Simply put…I am thankful for all that has happened to me. I will accept and appreciate the fact that my life was blown up and shattered into millions of pieces and I will embrace the fact that I have been able to persevere and, dare I say it, THRIVE thru all of the madness. I have learned that the only way to get thru anything and to put the pieces of my life back together is to walk thru it, eyes wide open. I’m excited to live my life being honest with myself/others and to have my own back, that is, I will never, ever, ever hand myself, my self-worth or esteem over to any job, any project, or anyone else ever again así nomas. Also beyond thankful that my parents and bonus parents are here with me after overcoming major health issues this year…love it that you are doing better every day Mama as well as our Ita! Learning more about my industry and learning how to grow my business. Studying and passing the State Bilingual Interpreter Exam…I was so close this time around! The months of anticipation are over. When I saw the envelope in my mail, I did a quick prayer asking God, Jesus and the Virgen of G to help me accept whatever the results were for my State Interpreter Exam. Upon opening the envelope, my eyes went right to the scores and I was able to see that, again, that I did not pass Phase II of this exam. I did what I always do on the major things in my life: called Mama. After I cried for a minute with my Mom, I realized that, ya que, I would have to break out the notes, the cds, and get back into study mode. I then looked at the scores and saw that I was 5 points or less from passing on all four parts – this always drives me crazy that I’m “almost there” but like Mama says, “it’s not your time yet”. Sometimes Inner Chingona gets on my last nerve LOL Why? As much as I try to be negative about setbacks in my life, I always seem to get in touch with Inner Chingona, who tells me “don’t be sonsatontapendeja, you have 5 more minutes to cry and then you’ve got to get yourself together and try again!” Which is so what I did. So this time: I will work out my study plan from now to exam time and NOTHING will get in my way. I studied for this exam thru pinche duress, stress, and every kind of obstacle thrown my way the first half of this year … THIS time, thankfully, I’m celebrating the fact that I’ve lived in relative peace and stability through the second half of 2013. The only thing I’ve got to stay out of is my own way and to DO the work, do my best, and not disappoint myself. ‘La tercera NO fue la vencida’ … so for Round 4, it’s got to work SMARTER to be able to go the distance! Y no me ahuito! 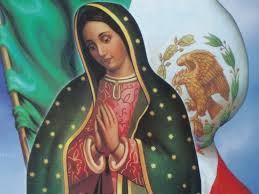 December 12th is a huge celebration day for latinos, mexicanos especially, around the world where everyone pauses either morning, noon, night, or overnight to honor her! Go into any Mexican house, business, or car and there is a good chance you will find a picture of La Virgen hung up somewhere, a candle, many times lit, with La Virgen, keychains with La Virgen, small altars honoring La Virgen. Many a man or woman have La Virgen de G tattoos, I once saw a woman who had her entire back tattooed with La Virgen of G. . Of course, one can always find the big celebration on Spanish-language TV at around 10 or 11 at night on Dec 11th and at Midnight Dec 12th, this is the #1 celebration in the world, at La Basilica de Guadalupe in Mexico City…steps away from Tepeyac, where Juan Diego actually saw her. This celebration is massive and colorful — pilgrims come from all over the world to honor and to thank La Virgen de Guadalupe for her help. 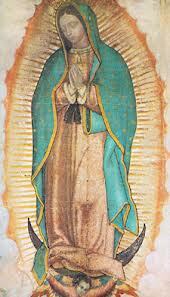 One does not have to be in Mexico City to feel the power of La Virgen de Guadalupe. Go to almost any Catholic church, anywhere, and there is some type of big celebration! 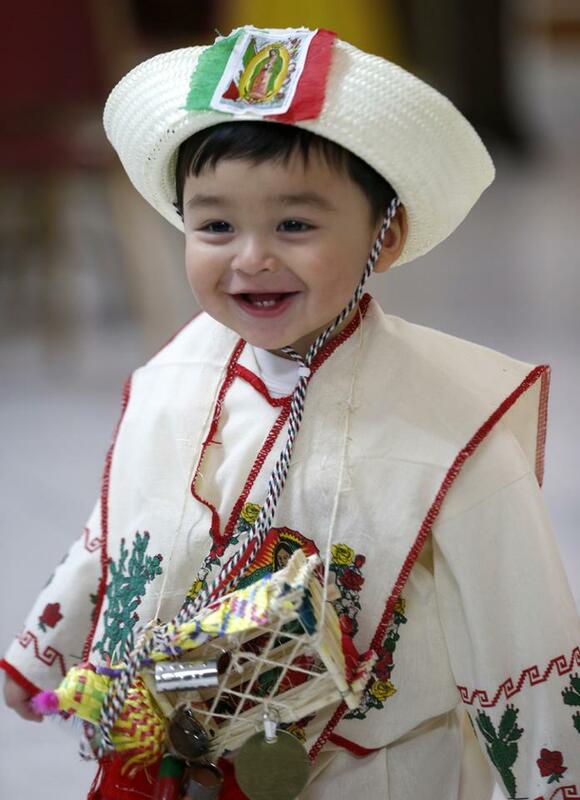 Love seeing the little ones dressed up in all of their Juan Diego or Mexican best during this time of year. Growing up in the Torres household, we could be found driving to church, one year in a really foggy night, to get there in time to celebrate “Las Mañanitas” to La Virgen at 5 or 6 in the morning, we used to even dress up back in the day. I’ll never forget one year when I was little, that after Las Mañanitas Mass, that the church was empty, or so I thought. 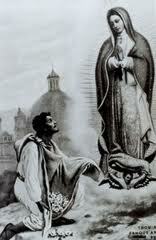 I heard music coming from the church, and, as I looked inside, who do I see but my Dad walking up to the altar, singing “Virgen Guadalupana” all by himself! . As kids at the Ranch, we did countless Rosaries at Grandma Ma Lupita’s house on our knees on that floor. 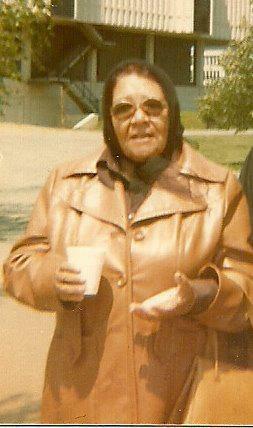 It’s our Grandma’s ‘Santo’ so we ALWAYS remember Mama Lupita on this day! Last year, 12-12-12 was an extremely emotional and important day for me. I left my office to try to hit one of the many masses in the area and ended up at Our Lady of Guadalupe Church, who had been having masses every single hour of the day since 5am. The church was packed beyond belief and I was inside of the lobby area and knew that there was no way that I would get into the actual church itself — but it was very important that I go there and thank La Virgen of G for HANDLING it and taking care of me as I started a new life and for always taking care of my familia! I may not be the most faithful churchgoer but I am convinced that La Virgen of G is, most def, watching over me and in my corner. 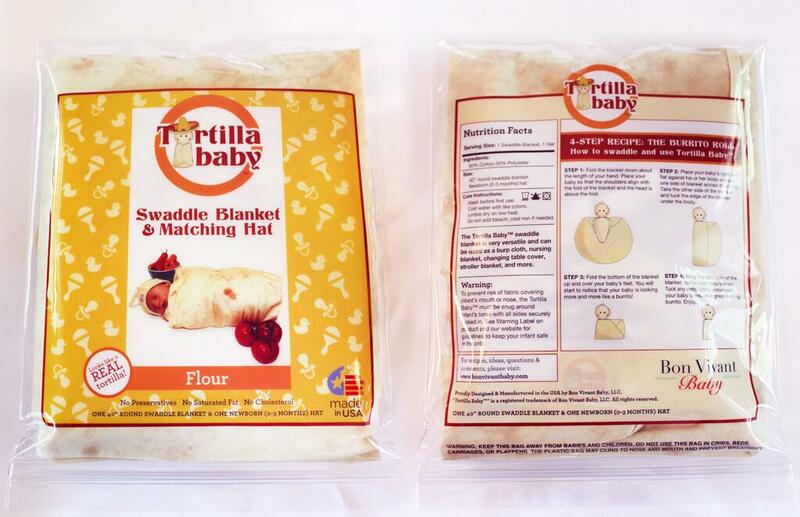 The Tortilla Baby Swaddle Blanket & Knot Hat costs US$48 and it is -sadly- for real. Click on the photo for more info and how to get one for your delicious bundle of joy. UPDATE: I have just found the instructions for this thing. WHO thinks up these translations? There are only a few things that need absolutely no explanation to make it to this blog. This is one of them. 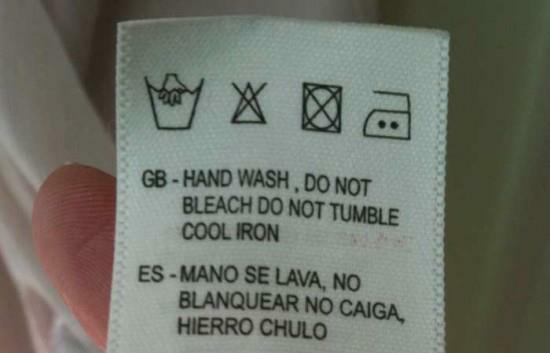 Whoever was responsible for finding the proper Spanish-language translation of “Cool Iron” and came up with THIS, deserves nothing but my most humble admiration -and an open invitation to a Happy Hour in New York City, at a bar of his/her choice. Last week, The New York Times released their list of Notable Children’s Books of 2013. And once again, they failed to include a single title written by or about Latinos. In fact, in the last 10 years only one book featuring a Latino protagonist and written by a Latino author – Marcelo in the Real World written by Francisco X. Stork in 2009 – has been included in the annual list. Over 52 million Latinos live in the United States. Isn’t it odd that not even one title that might reflect a portion of this growing demographic is included? This exclusion certainly isn’t for a lack of books. This year, dozens of children’s books reflecting the diversity of the Latino culture have been published. Crazy morning…got a call from a client saying that his ad schedule was wrong and that I was to credit him for commercials that ran without authorization. I look at the order and, see that, in fact, he was correct. I thought “chiiin…”, how am I gonna explain this one?” But then again, I started thinking, “how come I’ve never ran across this situation before?” Meanwhile, I’m watching as a chingo of emails are coming in telling me what I need to credit, etc. More stress. I then broke out the entire file and the contract and, went thru it page by page, and what did I find? 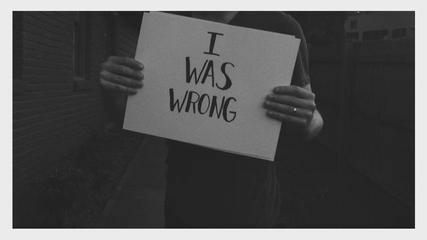 That I had actually done everything RIGHT. Thanking God that I didn’t respond to his email right away, I went and made copies and scanned them back to Mr. Cliente and yes! His signatures of approval were on the pages! His response to me, “you INDEED are right, my BAD!” LOL. Owning it, the good and bad, are lessons that I’m learning as I channel Inner Chingona and as I start to listen to that voice, that intuition … it’s all about taking a step back, taking a deep breath, and researching these types of things instead of reacting like you’re the one guilty of whatever you are being accused of! 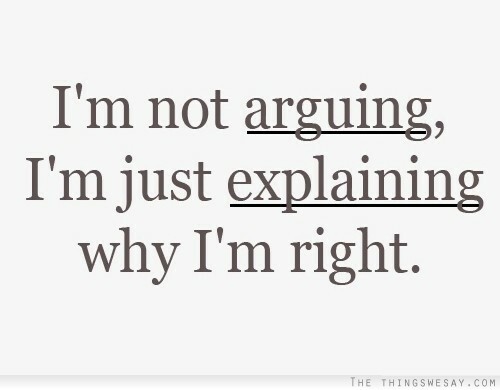 Conversely, when I’ve been wrong, instead of the drama, I simply say “I’m sorry”. Sure, I’m embarrassed but I’m finding out that owning up to things is actually very liberating and effective when in the workplace. 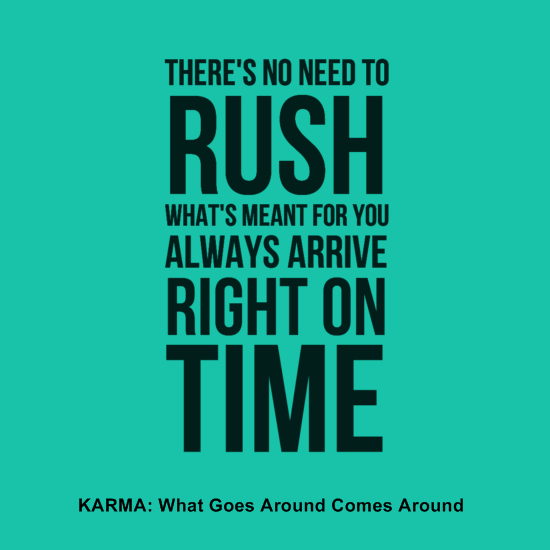 Not too long ago, I would have reacted screaming and shouting all full of drama…NOW I’m learning to be more proactive versus reactive. OMG! aaand as I write this, another client whom I go rounds with has just accepted another proposal I sent out! I now see the value of being prepared and putting my ideas together calmly versus all desesperada and rushed…love it! 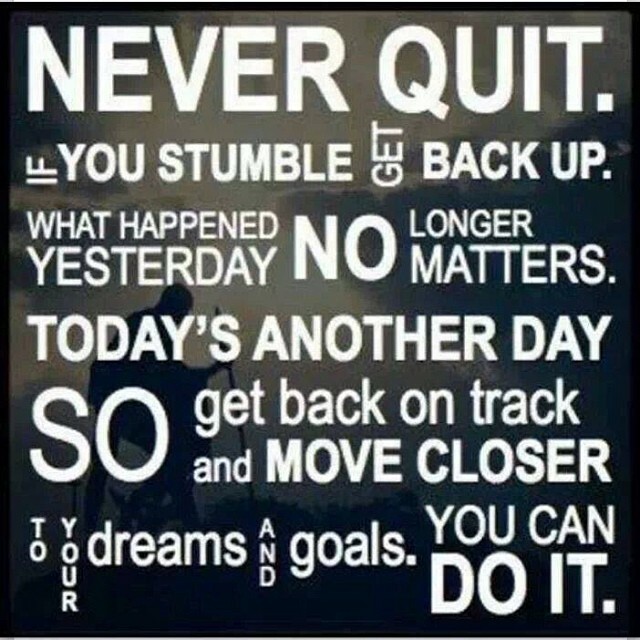 Go Inner Chingona … keep working it! Posted on December 3, 2013 by ctorres716Posted in La Radio, Mis Estudios, Y ahora que? It’s Not Applebees. 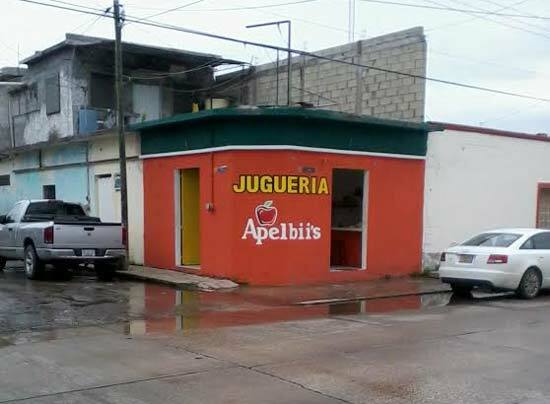 It’s Apelbii’s! Gotta love mi raza, working it always! See? How can anyone not like Mexicans? Unleashing Your Inner Chingona: Me? A Blogger? 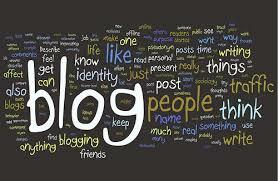 The key ingredient to successful blogging is exposure and expansion. One must be open and willing to trying new things, test it out and see if it would be a good fit for you/your brand. At this point should have a social presence somewhere and making it work for you. It is crucial to use the social tools that go in line with your message and you will find success. If you are looking to make your presence known in the social space or are wondering why you are not making more of an impact in the space, these five reasons may be why. You are nowhere to be found. It is not enough to have accounts on various social channels if you are not using them. If you want people to learn more about you, you need to be present and involved in the conversations going on in the social space. You don’t share the love. One way virtual relationships will get you nowhere. 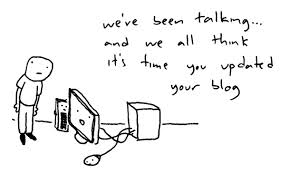 Visit blogs, FB pages, G+ pages and contribute to the conversation. You don’t share other people’s content/links. It is okay to share the content of others on your social channels. It is the entire reason why social media exists. 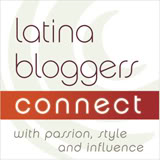 Share the latest trends, links, etc from your favorite blogs and news sites. Get people to trust your opinion, become a resource. You think others are going to ‘steal’ your ideas. I have said this time and time again, there is no such thing as competition in this space. Sharing a niche is the only thing you and a fellow blogger have in common. Your views, opinions, etc. are different from that of everyone else. 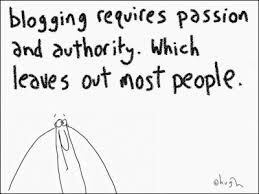 At the end of the blogging day, keeping tabs on what others are doing is not going to bring you the success you are looking for. For me, blogging is incredibly fun and it is something that I “have” to do … once I get into a writing groove, I can go for hours and hours writing and I have my list of places where I can really get into writing…I need a sturdy table, good natural light, headphones, music, and a little bit of noise and I’m good to go! Blogging, however, takes passion and commitment to gain you the following that you want…so as author Deborah Santana says, “get off your a#% and write”! and get it out there for the world to see and enjoy! As a member of Lowe’s Creative Ideas Network I received gift cards from Lowe’s in order to purchase supplies to complete projects. All opinions are my own. Each year we decorate the tree and each year I’m not content with the ornaments I have to choose from or the ones available at the store. None of the ornaments are quite what I’m looking for which means I end up looking for unconventional ways to remedy the situation. One year I even ended up hanging capiruchos on the tree! This year I decided I’ll make my own ornaments. Because the holiday season is so hectic, I wanted something that wouldn’t take too long, and because the budget is tight this time of year, I didn’t want it to be too expensive either. Here is the craft that resulted!